Hoffritz and black spring to boot. Less than perfect copies make for excellent mod fodder and are very reasonably price for their toolset. Thank you Sir SirVicaLot! It's certainly one of my favorites! The Explorer Plus was a nice surprise for me. I bought mine off fleabay as just an Explorer. I was very pleasantly surprised when it arrived. I had wanted this SAK after reading up on the different models and when I got it in hand I was not disappointed at all. It quickly dominated pocket time. The inline phillips is really what sets this SAK apart. Heck any SAK with the inline phillips is a win. My Explorer over the years has had to sit out from time to time in favor of my Swisschamp and a variety of other SAKs I was trying out. It has never sat for very long or ever got placed into the SAK drawer. There is just to much to like about the Explorer if you can do the layers. Mine lives in my Skinth and my older one in my hike pack. These are go to tools when I don't want to have to decide what to bring. Having my Explorer with me is like having a trusted friend. I know what it can and cannot do ( which is very little ). The addition of the plus scales are nice and the mini driver just adds to the utility of this wonderful SAK. I dream sometimes that VIC would make an 84mm version someday. Until then the Explorer will always be one of my most favorite SAKs. Well said Aloha! 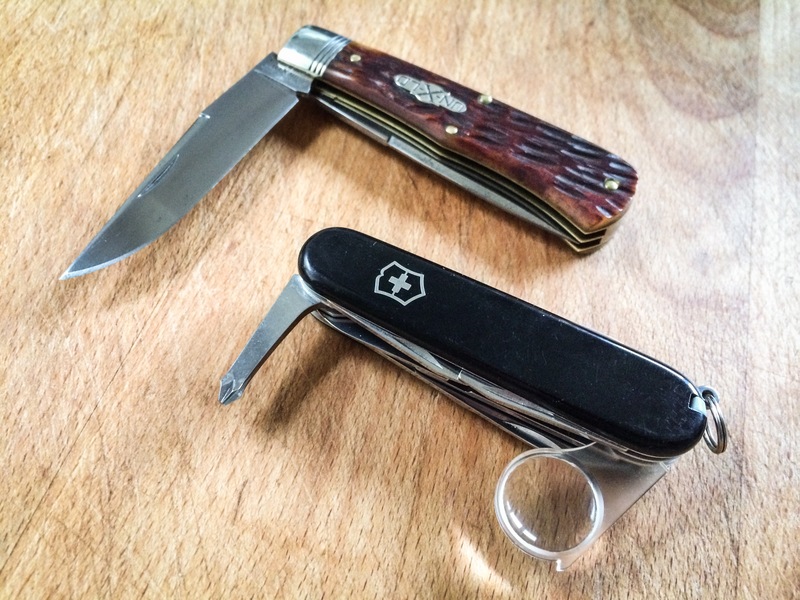 Just this morning I switched my work SAK back to an Explorer from a Deluxe Tinker. The backside Phillips failed to get the job done one too many times; the T-handle design limits where I can use it and you really can't put too much torque on it without risking damage to the knife. Also, I didn't use the pliers on the DT as much as I thought, so it sits in a box while my old Explorer gets a change of scales and a mini driver and put to use while I'm at work. I have an Explorer Plus that is my EDC and I have a hard time thinking about every carrying anything else because it covers all of my bases. Flippin 'eck! That GEC's lovely! Nice play on the knives! No Life Club Posts: 3,406 It is what it isn't. Did someone say Explorer's? I can't live without mine (the three amigo's) and even though I try others, I always come back to the Explorer! Usually carry the one in the middle with Ruby Plus scales! Mine is my first. And I'm becoming a fan. There is something very cool about Silver Tech scales. Nice! I like the Silvertech scales! I also have the White Tech/Snow style scales (not sure what they are called) but I don't have another Explorer to put them on! Of course since we have quite a few feet of snow here, white scales may not be the best idea! Thanks! There is just something about the Explorer and its tool set that just works for me! I like the inline philips alot and it fits in places where the back philips or MT bit philip setups can't get into! I put SilverTech on the Champ XLT also. The Explorer wears them better though. Glad you're liking your first exploration into that particular model. You'd get frost bite trying to find it! But, the Snow scales would look awesome on the Explorer. They really do have a "look". Almost like they are what Vic should have as standard scales in the 21st century. I like the traditional red, but the SilverTech would look more relevant these days. IMO of course.